SpaceX started with their Falcon 1 booster followed by several versions of the Falcon 9. The Falcon Heavy will fly later this year, and the rocket that will take the first person to Mars is called, for now, the Big F***ing Rocket or BFR. 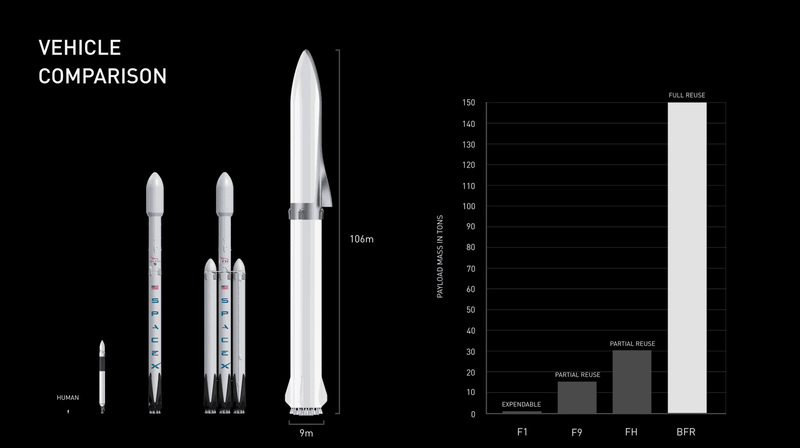 The 150-ton BFR payload will be ten times that of the Falcon 9. It will have an extra landing-guidance engine for reliable reusability and SpaceX also expects to be able to soft-land and reuse the second-stage payload rocket as well as its protective nose cone, substantially reducing cost per launch. 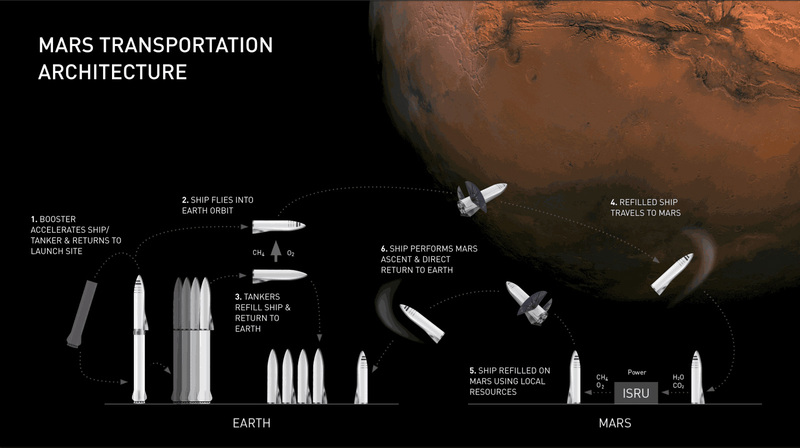 (Note that Boeing is also planning a Mars mission so they may be planning their own BFR). SpaceX started with their Falcon 1 booster followed by several versions of the Falcon 9 (source). Elon Musk is CEO and Lead Designer at SpaceX. The following is speculation, but I think the BFR will play a significant role the SpaceX satellite Internet service. SpaceX applied to launch their 4,425 satellites in two phases — an initial deployment of 1,600 satellites and a final deployment of 2,825. That is a lot of satellites, and the FCC has required licensees to deploy their full constellations within six years of their grant, but last month they relaxed that constraint, establishing milestones of launching 50% of a constellation within six years and allowing another three years to complete the constellation. The FCC has delayed licensing SpaceX's plan until spectrum sharing agreements are reached by satellite operators, so the clock has not yet started running on their six and nine-year milestones. SpaceX plans to send a BFR to Mars in December 2022, and they won't give me any details, but they will surely be used "locally" before that. They plan to begin launching operating Internet satellites in 2019, and those will be launched by Falcon 9 or Falcon Heavy rockets, but the BFR should be available to launch many of the planned 4,425 satellites before the FCC deadline and it will be used for replacement satellites when they are eventually required. 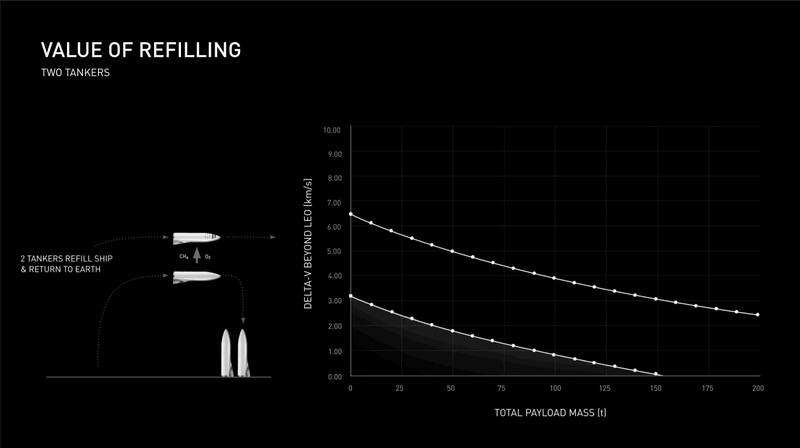 SpaceX estimates the satellite mass as 386 kg, and the BFR can carry a 150-ton payload so, if they fit perfectly, a BFR could launch about 350 satellites at a time, but they won't fit perfectly, so let's say 300 per launch. SpaceX Senior Director Tom Ochinero says they will be capable of up to six launches per month. 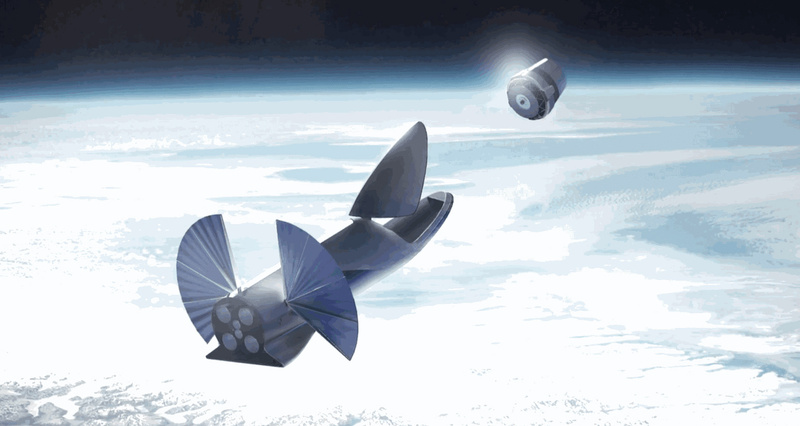 Using the BFR, 4,425 satellites in nine years sounds feasible and relatively cheap. (Elon Musk has estimated that future versions of the BFR may carry up to 1,000 tons). The BFR may also play a role in debris mitigation. When they are taken out of operation, satellites are de-orbited, and they burn up in the atmosphere, but there is some risk of debris hitting the Earth. 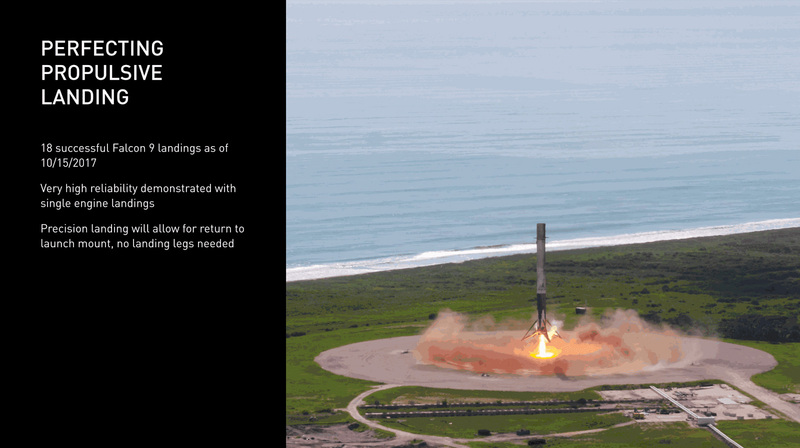 Bloomberg reported that the FCC had challenged SpaceX's assessment of risk of human casualty from falling debris and SpaceX responded the following month. Recently two Senators have also asked the FCC to investigate the risk of collisions and debris. 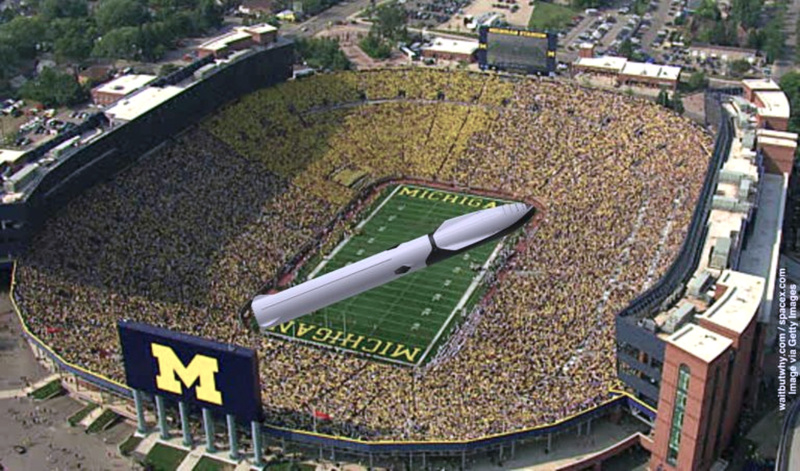 I will conclude with the following image that illustrates how the BFR got its name — it is a BFR. If you are interested in the BFR and its role in Elon Musk's plan to colonize Mars, you should definitely read the post this illustration is taken from. On October 15, Musk followed up his talk with an "Ask Me Anything" (AMA) discussion about the BFR on Reddit. You can read a good summary of the AMA discussion, which includes video excerpts from the IAC talk and a concept video on terrestrial travel here. If you have time on your hands to geek out, you can see the entire AMA session here. The much-delayed test launch of the Falcon Heavy rocket is scheduled for January 2018. The payload capability of the Falcon Heavy is about 2.5 times that of the Falcon 9 and around one-third of that of the BFR — "well over 100,000 pounds to low-Earth orbit" according to Elon Musk. (The Falcon Heavy test payload will be a Tesla Roadster destined for solar orbit — a good publicity stunt and a near-permanent symbol of our transition to alternative energy sources). The Falcon 9 will be used to launch SpaceX's first two prototype satellites next year, but in 2019, when SpaceX will begin launching operational Internet-service satellites, the Falcon Heavy will be available. The BFR will be available before the first Internet constellation is complete in 2024. SpaceX has released photos of the first Falcon Heavy rocket. It is expected to launch next month, putting a Tesla Roadster in solar orbit. When asked why he wanted to put the car in orbit, Musk said he loves "the thought of a car drifting apparently endlessly through space and perhaps being discovered by an alien race millions of years in the future," and so do I. That reply is even cooler than Mallory saying he climbed Mount Everest "because it's there." They hope to retrieve and reuse the three booster rockets. Elon Musk announced changes to the evolving BFR design and introduced their first moon passenger in a presentation at SpaceX headquarters. During the first portion of the talk, Musk outlined 18 changes to the BFR design. 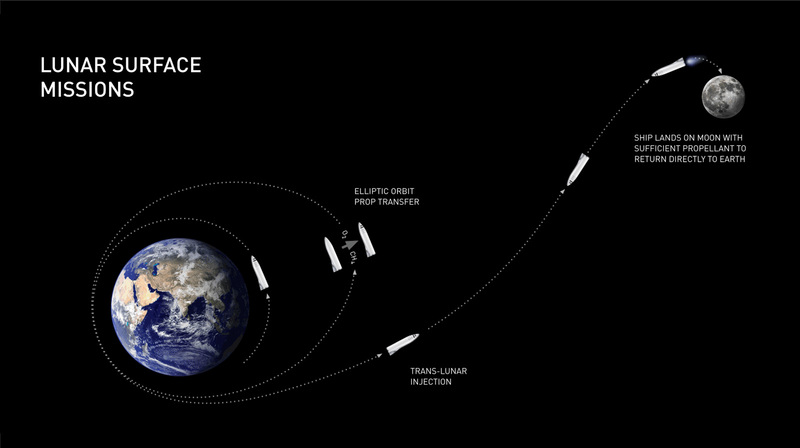 For example, as shown below, the payload capacity has been revised at least twice since the initial BFR announcement, the second-stage spaceship is larger and it has fins for landing and deceleration during reentry. The specific changes are each of interest, but the transparency of the engineering process is unique. Can you imagine Apple giving periodic public presentations on the evolving design of the 2022 iPhone and it's target applications every few months? Game on ... I'm glad he said that. that's great. I hope Boeing really goes, like, hard-core for Moon and Mars missions ... that would be really great. Musk's goal is for us to become a multi-planet species and he welcomes Boeing as a competitor and a collaborator. Similarly, he wants us to transition to renewable energy and sees Tesla as accelerating the renewable-energy plans of other automakers. His open-patent policy is further evidence of his working toward goals that transcend corporate growth and profit. Musk also introduced Japanese billionaire Yusaku Maezawa who has paid to be the first passenger on a BFR Moon trip. Maezawa also paid the fare for eight artists — he and Musk are clearly kindred spirits. Here is a video of Musk's talk. Local Time: Saturday, April 20, 2019 03:22 PM PDT – Page Load: 0.2732 Sec.